Dull, dreary hair color is never in style. Unfortunately, your fabulous hair color will start to fade as soon as you walk out of the salon. So how do you keep your color treated hair looking as fabulous as the day you got it done? Here are our dyed hair tips on how to keep your hair happy, healthy, and looking great. Remember that you should try to stray away from washing your hair for at least 48 hours after you get it dyed. Not washing your hair for the first two days will help prolong the life of the dye in your hair. Eventually, you will have to wash your hair, but have you thought about the type of shampoo and conditioner you should use? 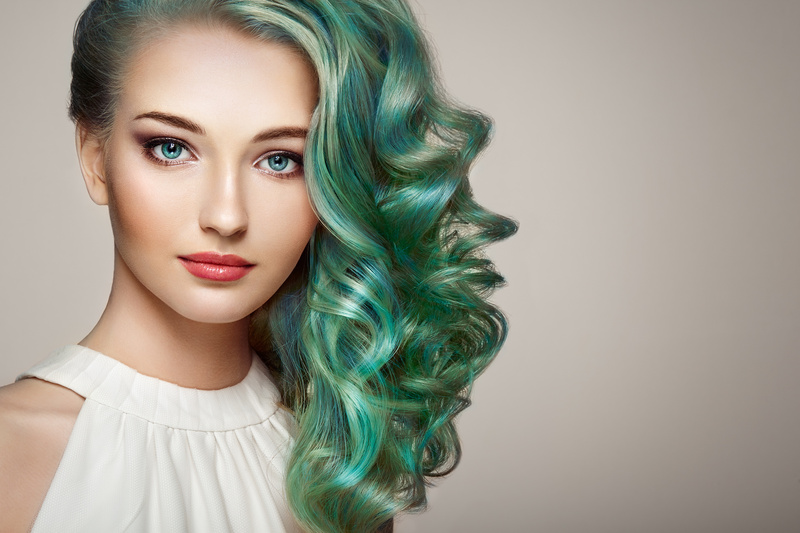 With color-treated hair, washing it too frequently might be the cause of the color washing out and ultimately fading quickly. To remedy this, we suggest investing in products that are “color safe.” Most should have that advertising, but for those that aren’t, find ones that are sulfate free. Shampoos and conditioners with sulfate as an ingredient are harsher on your hair and will quickly strip your hair of its color. You might also be able to find products that are meant to preserve your specific color of dyed hair (i.e., red, blonde, etc.). Integrating these into your hair routine occasionally will help keep your hair color bright and vivid. Hair products made specifically to keep your dyed hair looking amazing can often be a little costly. If cost is an issue for you, don’t worry. One pro tip is to use a little bit of your hair dye and dilute it by mixing the hair dye into a bottle of cheap conditioner. This way, when you are conditioning your hair, you are depositing some of the color dye back into your hair instead of taking it out. This bottle can easily last you weeks which should prolong the time between coloring your hair. Yes, we all love a nice hot shower or bath, but did you know that the hot water can actually lift and fade your color away much faster than if you washed your hair in colder water? Unfortunately, hot water tends to make the hair more brittle whereas colder water helps the hair remain strong. None of this makes for a happy head of hair that will maintain its original vivid coloring. A tip would be to use hot water for the majority of your shower but to switch over to a colder temperature while shampooing and conditioning your hair. This way you don’t have to go through an entire shower miserable in cold water, but you still get some of the benefits from washing your hair in cold water. Hopefully, this trick will allow for your hair color to live a little bit longer and help you stretch that dollar. Because you will be washing your hair less frequently to preserve your bright hair color, try using a dry shampoo on the days you choose not to use liquid products. Dry shampoo has become increasingly popular over the past couple of year s because of its ability to create more time in-between washes and the look of clean hair. Using a dry shampoo creates the look and feel of freshly washed hair without actually washing it. Dry shampoo works by having the powder trap and soak up the oils in your hair. Trapping the oil makes your hair lighter and feels much better which is extremely important for color treated hair. Believe it or not, what you consume has a lot to do with the health of your hair. Look for foods that have high amounts of iron in them. The iron will help with the production of keratin which creates strong and healthy hair. This should also help promote faster hair growth and stimulation. The healthier your hair is, the easier it is to apply color to it. The simple change of your pillowcase might save your hair. When you constantly are dying your hair, it is common to find it prone to breakage and becoming brittle. To save your hair from more breakage when you sleep, you might want to switch to a silk pillowcase. A silk pillowcase is kinder to your locks and won’t create as much friction when you toss around throughout the night. This also means that if you are prone to frizzy hair, it will calm down thanks to this silk pillowcase. Dyed hair is already damaged, adding the heat from hair styling tools like straighteners, blow dryers, and curling irons don’t help your hair situation at all. The added heat from these tools can cause extra breakage which probably isn’t the look that you were going for. When your hair is too weak, it may be challenging to try and dye it again in the future. Try to find styling and straightening methods that use minimal heat or no heat at all to achieve your look. Your hair will thank you for it later. If you can’t completely abandon your heat styling tools, choose only to use them sparingly like once or twice a week with the proper heat protectant spray for special occasions. This will at least be better than using them every day. These dyed hair tips can help your hair color look better even weeks after you have left the salon. When your hair color is looking fresh, you will feel more confident and happy with your hairs appearance. Tricovel products aim to also give you confidence by aiding your natural hair growth to get a fuller head of healthy hair. Take a look at our blog for more pro hair tips. Also, if you want to increase your hair growth and prevent hair loss, be sure to check how our products work.